This project will focus on prostate cancer. Prostate cancer (PCa) is the most commonly diagnosed cancer in men and the second leading cause of cancer death1. The key clinical challenge is accurate diagnosis of PCa aggressiveness. Only with an accurate diagnosis, each patient can receive the optimum treatment. Multi-parametric MRI (mp-MRI) is generally accepted as the most promising imaging modality for the diagnosis of PCa due to its high spatial resolution and excellent soft tissue contrast2. However, in its current form, mp-MRI only provides “contrast-weighted” images requiring a “subjective” assessment of cancer risk relying on the expertise of a trained radiologist. It has been reported that mp-MRI has widely varying and at best relatively moderate diagnostic accuracy3. Thus, many men still may be mis-diagnosed and require painful biopsies to confirm their cancer diagnosis. While fully quantitative multi-contrast MRI improves reproducibility and may be superior to assess tumor aggressiveness, it is not clinically used. The key challenges are: 1) To extract quantitative parametric maps acquisitions of multiple contrast-weighted images is required. This takes too long. 2) The pixel-wise fitting of images to simplified models of intrinsic tissue features may be inaccurate. 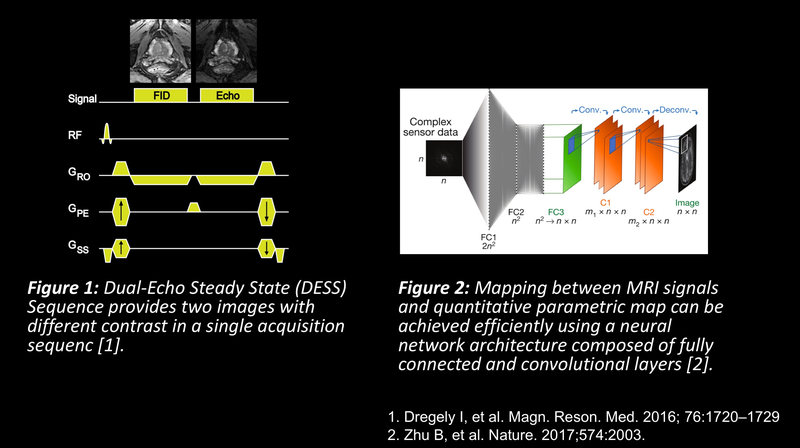 In this project we aim to address challenges in both, acquisition and reconstruction, by proposing “deepDESS”: 1) A Dual-Echo Steady State (DESS) sequence as a very efficient way to rapidly acquire multi-contrast data, and 2) A deep learning framework to extract quantitative biomarkers of cancer risk directly from the raw data signals. The initial focus on prostate cancer, the most commonly diagnosed cancer in men, addresses a key UK societal challenge, but can be extended to other cancer. If successful, the method for imaging-based precision diagnostics will enable earlier detection and stratification of significant disease, avoid overtreatment, reduce the need for invasive biopsies currently required by 1 million men every year in Europe alone, and improve quality of life by enabling precision radiotherapy treatment with minimal side effects. The research is timely, as the use of data-driven standardised analysis and in particular using emerging algorithms around artificial intelligence, requires current imaging to undergo a transition to yield quantitative, robust “data” which is at the heart of this proposal. Further, the multi-dimensional data will provide comprehensive information of intra-tumoral characteristics such as heterogeneity and microstructure organisation to yield better understanding of tumour biology under physiologically relevant conditions.